The Sanyo MIR 253 Cooled Incubator provides large capacity, accurately controlled environment over a wide range of temperatures. This refrigerated incubator has a temperature range between -10ºC to +50ºC, controlled from the keypad interface with digital screen set at the top of the instrument. From this control panel users can set their desired temperature, activate auto defrost, set and silence alarms, and define up to 3 programs each with up to 99 steps. Users of this Sanyo Incubator can choose to repeat their program multiple times, up to 99, set their independent high/low temperature limit, and choose their duration up to 99.5 hours. This cooling incubator is upright with a brightly lit, 9 cu ft interior, with fan circulation and adjustable wire shelving, lined with easy to clean stainless steel. 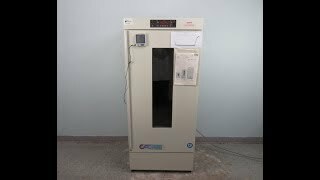 The low temperature of this low temperature incubator makes it a great choice for BOD applications as well as testing waste water, food industry packaging and quality control, as well as microorganism culturing and germination. This Sanyo MIR-253 Heated and Refrigerated Incubator was tested at -10°C and then at 50°C, system passed with a clean bill of health. All of our lab equipment comes backed with our standard warranty. Should you have any questions about this or any of our other incubators, please don't hestiate to contact us.